Michael joined UCB CLAA as Executive Director in February 2019, and brings extensive experience leading Cal Alumni and Latinx initiatives, along with Cal and UC student affairs experience. 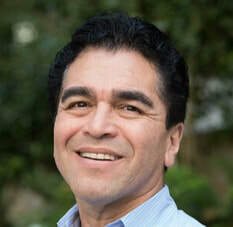 Michael served on the UCB CLAA Board of Directors, the Cal Alumni Association (CAA) Board of Directors and as Vice President, and the Campus Chicanx Latinx Task Force. Prior to joining UCB CLAA as Executive Director, Michael served as Assistant Dean of the UC Berkeley Goldman School of Public Policy, Assistant Dean of UC Hastings College of the Law, Director of Undergraduate Admissions (Systemwide) for UC Office of the President, and Assistant Dean of Student Affairs at UCSF. Michael earned his AB in history and social sciences from Cal, his MEd in higher education leadership and policy studies and JD from the University of Washington, and he is a graduate of the Harvard Administrative Fellows Program. I enjoy learning new things, meeting new people and creating new experiences. CLAA has opened many doors for me and has allowed me to develop my communication and management skills. CLAA has many resources such as scholarship and fellowship opportunities that help students develop much needed skills! I hope CLAA can be an aid in the success of underrepresented students here at Cal! Christine recently graduated during the summer of 2018, and began serving CLAA since July 2018. She recommends students take advantage of CLAA Alumni and their networks in order to get different professional perspectives. I was bestowed with the opportunity of being able to learn with magnificent peers and knowledgeable teachers everyday. I am devoted to learning new things not only within the classroom but also outside in the Berkeley community. When I heard about CLAA I decided to join because I admire their mission. I am committed towards doing my best in order to assist CLAA and better serve my community. my education by attending graduate school and working in the K-12 educational system. ​ and phone calls with Cal Alumni. It truly is a great place way to network! I have been granted the honor of being a fellow for the Chicanx Latinx Alumni Association, where I hope to assist in expanding the reach of CLAA in order to continue helping students make the most of their potential with the support means necessary to succeed. What I love most about CLAA is it provides a sense of community through platforms like Conexiones that remind students that there is a community at Berkeley that supports them.